Star Trek made a lot of money this weekend and The Movie Blog just compared this success with the rest of the movie franchise. And do you want to know what my first thought was, when I read this post? No? Well, I didn’t think about a franchise that finally made it and fully deserved it or thought about the abysmal quality in recent years. And I didn’t felt compelled to watch Star Trek now. No. My first thought simply was: did they adjust the opening grosses for inflation? Sometimes I read about the fact that Star Trek was a franchise that aimed for its fans and mostly made money with them. Frankly spoken I didn’t care that much about this information. But these results seem to prove it at least on some level. As you can see, the adjusted box offices didn’t vary that much from Star Trek: The Motion Picture to Star Trek: The Undiscovered Country. I would even say they were the same regarding a certain inaccuracy of adjustments methods you cannot prevent (I used the average ticket price to get the results, for example). This indicates that most of the movie goers in the first few days of each respective entry were mostly trekkies or trekkers, while the size of this fanbase seemed to be constant over the years. Another tidbit that gets visible is the rise of grosses that starts with the first Next Generation movie and kept its momentum until Star Trek: Insurrection more or less ruined it. Unfortunately, as most of us know, Star Trek: Nemesis didn’t help that much either, for being one of the worst entry of this genre. Number games can be quite interesting some times, even if it’s almost one o’clock in the night. 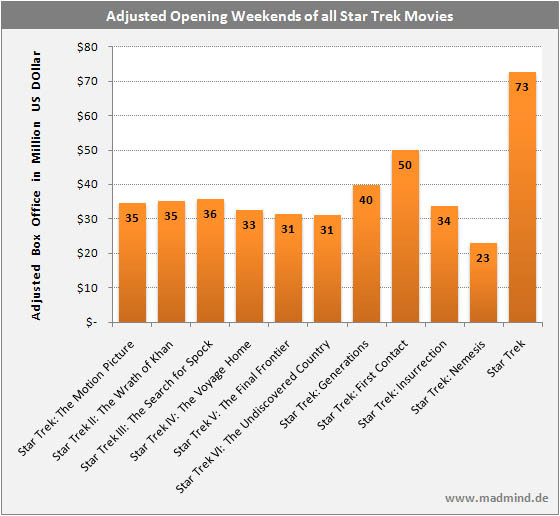 Oh yeah, I almost forgot: even with the opening weekends adjusted, the lastest installment of Star Trek still made tons more money than the rest (perhaps except First Contact, but that would be nitpicky and the Paramount of Obvious. ……oh my…what a lame pun…).